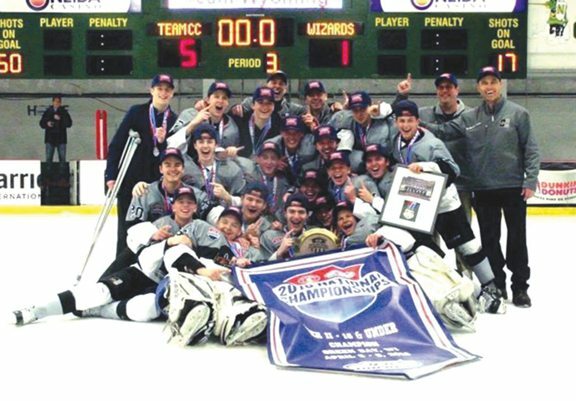 ASHWAUBENON, Wis. — With a chance to repeat as 18-under Tier II national hockey champions, Team Copper Country came into Monday’s title game against the Wonderland Wizards a bruised and battered bunch. Down a couple of skaters, Team CC found a way to play a smothering style that allowed it to keep the Wizards from being able to bounce back as they had in pool play, and in the end, the locals came away with a 5-1 victory at Cornerstone Community Center. The win was special for a number of reasons: the decision to add skaters from outside of the local area this season, the number of players who were playing with heavy hearts due to family complications, and the fact they were playing two players short, to name a few. Though the team was primarily made up of players from Houghton, Hancock and Calumet high schools, among the added skaters was Marquette Senior High School all-state senior Joe Phillips and Kingsford’s Daunte Fortner and Nick Murvich. The fact that Team CC was able to roll as strongly as it did despite an injury to Hancock’s Alex Nordstrom and a suspension to Hancock’s Teddy Perrault said a lot about the depth of the group and the effort the team put forth to play in the title game. Playing without the likes of Nordstrom could have cost Team CC against a team made up of some of the top high school players from Bridgeport, Connecticut. Instead, the group formed some new lines and went to work. In pool play, the Wizards erased a 3-1 lead late in the contest and forced a shootout, which Team CC managed to emerge victorious from. From the drop of the puck on Monday, it was clear Team CC had not forgotten the lessons learned from that experience, as it kept the Wizards on their heels, outshooting them 14-5 in the opening 17 minutes of play. The middle frame was much the same as Team CC continued to pour on the offense. It seemed like just a matter of time before Wizards goaltender John McGee would crack, and he finally did when Hancock’s Colton Salani found the net 8:05 in. Breaking through and getting that lead proved important to Team CC, who scored the first goal in every contest. During last year’s tournament, it finished the weekend trailing in points in five of the final six periods played. Houghton’s Dawson McKay added the team’s second goal with just 13 seconds left in the middle frame, a period which saw Team CC outshoot the Wizards 19-3. Situational hockey, as Stipech calls it, became key at the start of the third period. Given that the Wizards had found a way to claw back into the pool game, Stipech and his staff made their players aware that the same thing could not happen again on Monday. Unfortunately, the game took a quick turn just 34 seconds into the third when the Wizards drew a penalty shot and scored. The question that lingered on Team CC’s bench at that point was ‘How would the team respond?’ Rather than allow the Wizards to build momentum off that tally, the locals stormed back and Calumet’s Brent Loukus beat McGee cleanly with a wrist shot just under a minute later during a delayed penalty situation. Loukus, who had been asked to make adjustments to his game throughout the weekend and responded as expected, created the turning point in the contest with his goal. From there, Team CC continued to put pressure on McGee and Hancock’s Teddy Randell, who was going to draw the penalty on Loukus’ tally, extended the lead to three. Marquette’s Joe Phillips and Calumet’s Sam Erkkila both picked up their second assists of the game on Erickson’s goal. 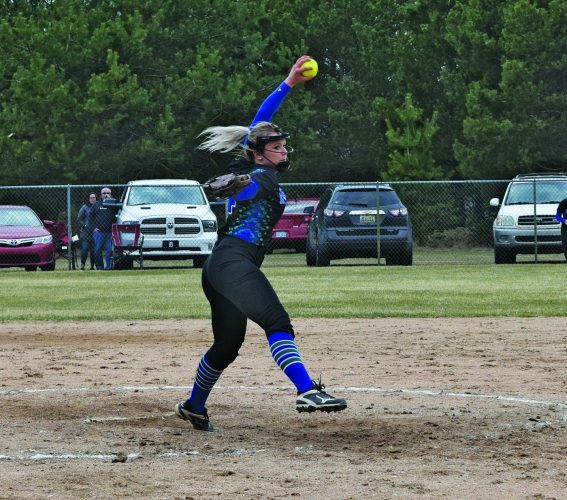 Philips, along with Kingsford’s Daunte Fortner and Nick Murvich, and Superior’s Max Curtis, added something special to Team CC by giving the group the depth needed for a five-day, six-game weekend. Phillips, whose mother is battling breast cancer, joined Houghton’s Kevin Bostwick, and Fortner as players who were dealing with major family illnesses off the ice at the same time as they were competing as hard as they could on it. Stipech, who tried throughout the weekend to downplay as much of the off-ice experience as he could manage, was proud of the efforts of all three. “I am so happy for the families,” Stipech said. “We didn’t talk about it a lot.